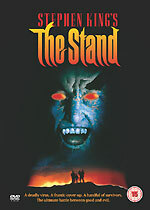 Warner Home Video is releasing the ABC's six-hour 1994 mini-series based on Stephen King's mammoth novel The Stand on April the 5th. The Emmy-winning series, which starred Gary Sinise and Brat packers Molly Ringwald and Rob Lowe, will be presented in 4:3 format, with Dolby Digital 5.1 audio (the US disc, from Artisan, is 2.0 only). The two-disc set will be supported by a commentary track (by author Stephen King, director Mick Garris, and actors Ruby Dee, Rob Lowe, Miguel Ferrer, Jamey Sheridan and editor Pat McMahon), a short Making of... featurette, storyboard comparisons and make up effects gallery. RRP is £19.99. 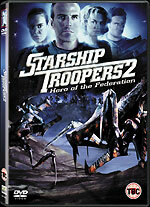 Here's a look at the Region 2 sleeve for Columbia Tristar's Starship Troopers 2: Hero of the Federation DVD, which is due on April the 19th. No further information is available. I've updated the Hammer DVD guide, to add that Warner Home Video will be releasing Region 1 discs of Frankenstein Must Be Destroyed, Dracula Has Risen From The Grave and Taste The Blood of Dracula (as well as a box set with these titles and Curse of Frankenstein, [Horror of] Dracula and The Mummy) on April the 27th. Eureka will release Fritz Lang's 1932 classic crime thriller The Testament of Dr Mabuse (Das Testament des Dr Mabuse) on March the 15th. The film has been fully restored and digitally remastered. The disc will feature optional English subtitles, a documentary by R Dixon Smith and a photo' gallery. RRP for the disc is £22.99. Stephen Poliakoff collection - Three acclaimed dramas from one of Britain's finest writers: Perfect Strangers (2001), Shooting The Past (1999) and Caught on a Train (1980). Each disc features a commentary track by Poliakoff and a twenty-minute documentary. Perfect Strangers has an RRP of £19.99; the other two are £15.99. Only Fools and Horses - the 1996 Christmas specials. These hour-long episodes will be available separately (with a urine-extracting RRP of £16.99 each) or as a Christmas Trilogy box set, with a barely-less staggering RRp of £34.99. For three hours' worth of entertainment. The episodes are Heroes and Villains (the Batman and Robin episode), Modern Men and Time On Our Hands (the antique watch episode). Charles II - The Pride and the Passion - commentary by director Joe Wright, Producer Kate Harwood and writer Adrian Hodges. Also contains the hour-long documentary The Boy Who Would Be King. RRP is £19.99. Jonathan Creek - Series 1 and 2 - The BBC have ditched their plans for a much more comprehensive - and more reasonably priced - box set containing almost all the episodes to date, and will instead release a Series 1 and 2 box set, containing "all eleven episodes from the entire first and second series (including the pilot episode)". (I quote this because there's been some confusion). The set will contain "some" additional features, including an exclusive documentary, Long Hair and Duffel Coat and "commentary by director Marcus Mortimer and David Renwick". Clear as mud. RRP for the set is £39.99. Old Grey Whistle Test - Volume 3 - Performances include Bowie's Oh You Pretty Things (1972); The Bangles' Walk Like an Egyptian (1986); Steppenwolf's Born To Be Wild; Al Stewart's Year of the Cat; BB King's When It All Comes Down; The Jam's A Bomb in Wardour Street; King Crimson's Frame by Frame and The Jesus and Mary Chain's In A Hole. Special features include commentary by Mark Ellen, David Hepworth and Andy Kershaw, an artist's gallery, and options to view by year, or view by presenter. RRP is £19.99. Red Dwarf IV - with three hours of bonus material, including cast commentary, deleted scenes, Smeg Ups, raw effects footage and isolated score. Includes the episodes Camille, DNA, Justice, White Hole, Dimension Jump and Meltdown. RRP is £19.99. 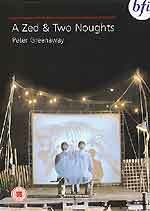 BFI Video are releasing two Peter Greenaway films, A Zed & Two Noughts and The Draughtsman's Contract, on February the 23rd. The director has worked closely with the BFI on these releases, and has contributed filmed introductions, commentary tracks and sleeve notes. Both discs will also feature behind the scenes footage, the theatrical trailer (both trailers are on both discs), and Easter Eggs. 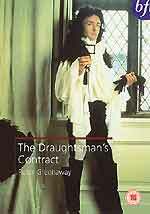 The Draughtsman's Contract will also feature an interview with composer Michael Nyman, on-set interviews, a featurette about the film's digital restoration and deleted scenes. The A Zed & Two Noughts disc features fourteen minutes of bonus material; The Draughtsman's Contract extras run for forty-one minutes. Both films will be presented in 1.66:1 ratio, with anamorphic enhancement. RRP for each title is £19.99. 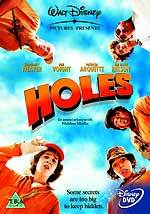 Buena Vista is releasing the very popular family adventure film Holes on March the 22nd. The film, which features Sigourney Weaver, Patricia Arquette and Jon Voight, grossed more than $65m in the US, and did pretty well over here, too. The disc will feature two featurettes (The Boys of D-Tent and Digging the First Hole); deleted scenes; a gag reel; cast commentaries; a director's commentary and the D-Tent Boys music video Dig It. The press release didn't include any technical details, or mention the RRP. Paramount are releasing The Fighting Temptations on April the 5th. The film, about a con artist (Cuba Gooding Jr) who must coach a local gospel choir to success in order to claim an inheritance, with help from a nightclub singer (Beyoncé Knowles). The disc will feature eight extended music numbers, seven deleted scenes and the film's theatrical trailer. The film will be presented in Dolby Digital 5.1 audio. The press release did not mention any other technical spec's. RRP for the disc is £19.99. The winners of last week's A Very Peculiar Practice DVD competition are M. Watts and Claudia Marcel, who both knew that Peter Davison starred as a vet in All Creatures Great and Small. The Michael Bentine's Potty Time competition was won by Ray Crawford and Mike Arnold, who both knew that Michael Bentine starred in The Sandwich Man. My congratulations to them, and thanks to Network for providing the prizes. Apologies to regular visitors for the lack of updates last week, which was due to problems encountered whilst re-building my PC. The ground-up re-install has enabled me to get rid of several years' worth of accumulated clutter, and has improved the PC's performance significantly. I've also taken the opportunity to upgrade various software packages, which means that there may be a few glitches to iron out over the next few days, so please bear with me. I've also got a huge backlog of email to tackle, so apologies to anyone expecting a reply. My thanks to Paul for all his help and advice in getting the PC working again. There are two new competitions for you to enter today, should you wish, where you can win a pair of classic Ray Harryhausen films (The Beast from 20,000 Fathoms and The Valley of Gwangi), or a set of Carlton's Best of British New Wave collection, which includes Hell Drivers, Seance on a Wet Afternoon, Servant and The League of Gentlemen. Click on the banners above, or here for the Harryhausen competition, and here for the British New Wave competition. The winners of last week's competitions (for Michael Bentine's Potty Time and A Very Peculiar Practice) will be announced either later today (if there's more news today I'll add it to the site) or with the next News update (i.e. : later this week, possibly tomorrow). Rest assured that no competition entries were lost whilst the site was "resting" - all the entries were held on the server until I was ready to download them! 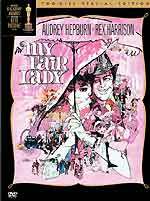 Warner Home Video will be releasing a two-disc edition of My Fair Lady on April the 5th. The disc, celebrating the film's 40th Anniversary, will feature a new hour-long documentary More Loverly Than Ever - The Making of My Fair Lady; a commentary by art director Gene Allen, singer Marni Nixon and restoration experts James C Katz and Robert A Harris (which is on the current DVD); several galleries of production stills, documents, drawings and costume sketches; Audrey Hepburn's original vocals for Wouldn't It Be Loverly and Show Me (Marni Nixon re-dubbed Hepburn in the film); footage from the Los Angeles premiere; Rex Harrison's Golden Globe acceptance speech and 37th Academy Awards footage; and "comments" from Martin Scorsese and Andrew Lloyd Webber. The disc will be presented in 2.40:1 anamorphic widescreen, with Dolby Digital 5.1 audio, with optional English subtitles. The RRP is £19.99. Hi everyone, a couple of new titles, some date revisions and a shed load of information on extras in this week’s update to the Incoming page and more bargains included on the Offers page. First up, lets have a look at the Film highlights to the Incoming update. The Planet Of The Apes - 35th Anniversary Edition from Twentieth Century Fox is now showing for the 26th of April. The extensive extras for this two-disc release are predominantly archive material (much of it previously available on Image Entertainment's Behind the Planet of the Apes two-disc R1 DVD), but there are some newly created features as well, including two new commentary tracks: one by composer Jerry Goldsmith and antoher by cast members Roddy Mc Dowell, Natalie Trundy and Kim Hunter, Producer Richard Zanuck and Make-up Artist John Chambers. 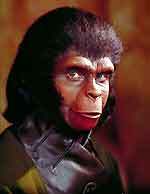 Other bonus materials include a documentary entitled A Look Behind the Planet of the Apes which has a runtime of 14 minutes; A Makeup Test with Edward G Robinson, running to 9 minutes; 20 minutes of Roddy McDowall’s Home Movies; a Dailies and Outtakes Reel, again lasting for 20 minutes; J. Lee Thompson directs Conquest of the Planet of the Apes and Don Taylor directs Escape from the Planet of the Apes featurettes, running to a 1 minute and 8 minutes respectively; a NATO Presentation film from 1967, which lasts 10 minutes (that's the National Association of Theater Owners, not the North Atlantic Treaty Organisation! ); a Planet Of The Apes - 35th Anniversary Edition featurette at 5 minutes; the original theatrical trailers and teaser trailer; film reviews; theatrical posters; photo galleries; and an Easter Egg. The BBFC has cleared some extras for Fox’s forthcoming Master and Commander release on March the 22nd. These are a featurette called In the Wake of O’Brian which runs to 21 minutes; some multi-angle studies running to 14 minutes; 6 deleted scenes totalling 23 minutes; a look at the model work in the film in Model Ships, which lasts 2 minutes; and two trailers: the 2 minute, All on board with Russell Crow, and the 3 minute, Behind the Adventure. The BBFC has also listed some extras for Columbia-Tristar’s S.W.A.T., again for the 22nd of March. It will have two commentary tracks, from the director and cast; eight Deleted Scenes; three featurettes: Anatomy of a Shootout, S.W.A.T., TV's original Super Cops and Making of S.W.A.T. ; a blooper reel; some filmographies and the theatrical trailer. As reported here a couple of weeks ago, DD Video are preparing The Creeping Flesh and Night of the Big Heat. These are now showing for the 22nd of March and both have an RRP of £15.99. DD Video are also re-issuing some of their previous Hammer releases as double packs. These are The Abominable Snowman/ X The Unknown, Frankenstein And The Monster From Hell /Captain Kronos - Vampire Hunter, and The Quatermass Experiment/Quatermass 2 and are listed for March the 8th, with an RRP of £22.99 each. Michael Moore’s documentary Roger and Me, from Warner Home Video, has a revised date of March the 15th. Finally, for the Film highlights, is Spike Milligan’s The Great McGonagall, the 1974 film starring Milligan and Peter Sellers and directed by Joseph McGrath. The release is listed as Region 0 from Fabulous Films with a commentary by McGrath and Robert Ross, with cast and crew biographies as extras. It’s lined up for February the 9th and an £9.99 RRP. There’s been lots of information added about the extras for some of the forthcoming American TV box sets, which are either being listed by the retailers or have been cleared by the BBFC. The Angel – Season 4 box set has an Angel – Season 4 featurette (39 minutes); Unplugged: Season 4 outtakes (3 minutes); Last Looks: The Hyperion Hotel (6 minutes); Fatal Beauty and the Beast (6 minutes); Malice in Wonderland: Wolfram and Hart (8 minutes); Angel and the Apocalypse (7 minutes). Buffy The Vampire Slayer – Season 7 box set has several featurettes: Season 7 Overview - Buffy: Full Circle (36 minutes); The Last Sundown (9 minutes); Generation S (8 minutes); Buffy 101: Studying the Slayer (14 minutes); It’s Always Been About The Fans (4 minutes); Buffy Wraps (5 minutes); as well as an Outakes Reel (3 minutes) and an Easter Egg (34 seconds). 3 featurettes so far listed for the C.S.I. – 3.1 box set: CSI moves into Season 3 (13 minutes); The CSI Tour: Police Station (9 minutes); The CSI Shot: Making it Real (17 minutes). The Firefly box set has commentaries; deleted scenes (12 minutes); Alan Tudyk’s Audition (1 minute); and a gag reel (3 minutes). And lastly, the Roswell – Season 1 box set has commentaries; deleted scenes with optional commentary; gag reel; an Area 51 featurette (30 minutes); a Roswell High featurette (10 minutes); Actor Audition Segments (2 minutes); Tess and Isabel Meet at Lunch (1 minutes) and a music video. There’s new information on some of BBC Worldwide’s releases. Choices Direct are listing the 26th of April as a revised date for The Day Today. This delay is probably caused by work on the release’s special features. As hoped Stephen Poliakoff’s Caught on a Train and Perfect Strangers will have a commentaries from him and 20 minutes documentaries, like his Shooting the Past release. All three are due on the 9th of February. Trying to squeeze out more sales in the wake of the series' success at the Golden Globes yesterday, there is a The Office - Series 1 & 2 box set now being listed for the 22nd of March with a £29.99 price tag. The recent Christmas Specials are expected to be released around the same time. Towards the end of last year a Top of the Pops – 40th Anniversary release was being listed, but it then was pulled. It has now re-appearred on Play.com for the 1st of March with a £19.99 RRP. The third volume of BBC Worldwide’s The Old Grey Whistle Test compilations, which is expected on February the 16th, will include newly filmed interviews; a commentary by presenters Mark Ellen, David Hepworth and Andy Kershaw; an artists' gallery and options to view by year or by presenter. A further treat for music fans is a release of Channel 4’s 1980s music show The Tube which is now listed for the 22nd of March from Universal-Island with an RRP of £16.99. No word on what the actual content will be yet. There are some revised dates for a couple of Acorn releases. The To Serve Them All My Days box set and it’s single volume Part 1 are now listed for the 15th of March, and the Tenko – Series 3 box set now has a date of April 19th. The 1980s British cartoon series Henry’s Cat, which was previously reported as being cleared by the BBFC from label Delta, is now being listed for March the 15th, with a retail price of £5.99. More animation also due on March the 15th are further volumes of the American series Spawn, the comic book creation of Todd McFarlane, from label Medusa. Season 2.1, Season 2.2, Season 3.1 and Season 3.2 are listed, each with a retail price of £12.99. I’ve added That Peter Kay Thing, Peter Kay’s Channel 4 series of pilots that spawned Pheonix Nights, for the 25th of October (as listed by Play.com) from label VCI. But it’s been on the schedule for around the past 10 months and it’s continually being delayed, so when it’s actually going to be released is anyone’s guess. There’s another date revision for a Michael Moore release – his Channel 4 series, The Awful Truth – which is now listed for the 1st of March. As a final TV round up: a Season 2 box set is showing of the New Zealand children’s drama series, The Tribe, shown here in the UK on Channel 5. RRP for the set, which is pencilled in for March the 29th, is £29.99. Fabulous Films are re-issuing their Monkey DVDs in box sets: Box Set 1 covering the first half of series 1 (episodes 1 – 13) is listed, again for March the 29th, with a £39.99 retail price. There’s quite a few bargains added to the Offers page this week. Firstly, just a quick note to say if you haven’t taken advantage of any of the ‘January’ sales listed on the page do so soon, as they will be ending shortly. Thanks to Adam McGechan for posting on Roobarb’s DVD Forum that Amazon have the Jeremy Brett complete Sherlock Holmes Collection box set for £79.99 (£80.00 off). Benson’s World have started two new sales covering releases from the labels Eureka and Kult / Contender. They are also offering several Acorn titles, which are either recent releases or are available for pre-order, at good prices. These are A Family at War - Volumes 1-3, Raffles - Volumes 1 and 2, To Serve Them All My Days - Part 1 and When The Boat Comes In - Series 2 - Part 1 all at £12.99 (£7.00 off). Red Dwarf – Series 4 and Tomb Raider 2 – The Cradle of Life both have had their pre-order prices reduced to £12.99 at Blackstar (£7.00 off). Thanks to Ross Gowland on Roobarb’s DVD Forum for posting that dvd.co.uk have Network’s The Adventures of Robin Hood – The Complete First Series box set for £17.99 (£22.00 off), they also have the 3 film Hammer Horror Originals box set at £17.99 (£12.00 off) and the 1943 version of Phantom of the Opera at £7.99 (£12.00 off). HMV have the new Mallrats – Special Edition for £9.99 (£5.00 off) and the Starsky and Hutch – Series 1 box set for £25.99 (£9.00 off). Finally, I’ve added a new retailer to the page – Loaded247.co.uk. For those of you that missed Network’s forthcoming Sykes – The First Colour Series on Play.com when it was offered for £14.99, Loaded247 currently have it for that price. This 3 disc set comprising all 16 episodes of the 1972 series, several of which are extended, combined with loads of extras really makes the release a must buy for any fan of archive television and this bargain price is £10.00 off the RRP. Previous News entries can viewed be by following this link.